Pristine forests, dense verdant valleys and quiet alder-lined creeks characterize this concise Coast Range gravel loop through the Tillamook State Forest. Don't let the easygoing purlieu fool you - this is a bona fide climber's route, gaining 5700 feet over a relatively succinct 46 miles. 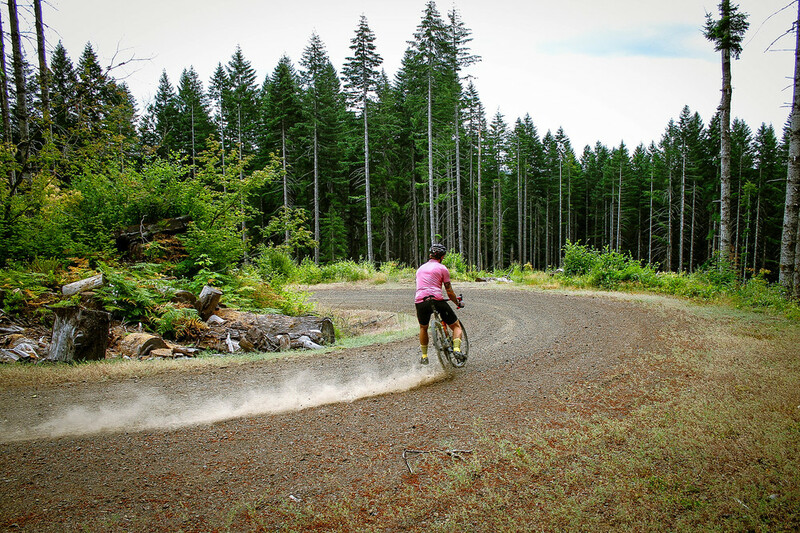 This compact gravel loop begins at Reehers Camp, just outside of Timber, OR, a quiet logging town located between highways 26 and 6 at the eastern edge of Tillamook State Forest. Parking is available at Reehers Camp, which is adjacent to Cochran Road at the 2 mile marker. The campground is built on the site of the original Civilian Conservation Corps camp from 1934. The route begins by heading west on Cochran Road through dense rolling Douglas Fir forests on a surface of well-maintained smooth gravel. At mile 1.5 take a left onto Round Top Road where the climbing begins in earnest around mile 3. Immediately after passing the 3-mile mark, bear right at the fork and keep climbing. This route is frontloaded with a bracing dose of elevation gain, 1600 feet in the first 7 miles. The payoff becomes evident at mile 4, as Round Top Road climbs higher and higher into enchanting, mist-enshrouded cloud forests providing expansive views to the east and south. Around mile 5, stay straight and follow Bell Camp Road, which gently rolls along the ridge spine through sparse, selectively cut forest and intermittently active logging operations. As Bell Camp begins to descend, watch for the hard-right 180-degree U-turn onto Standard Grade just after mile 8. As Standard Grade turns north/northwest and continues to descend, be alert for the fork around mile 9. 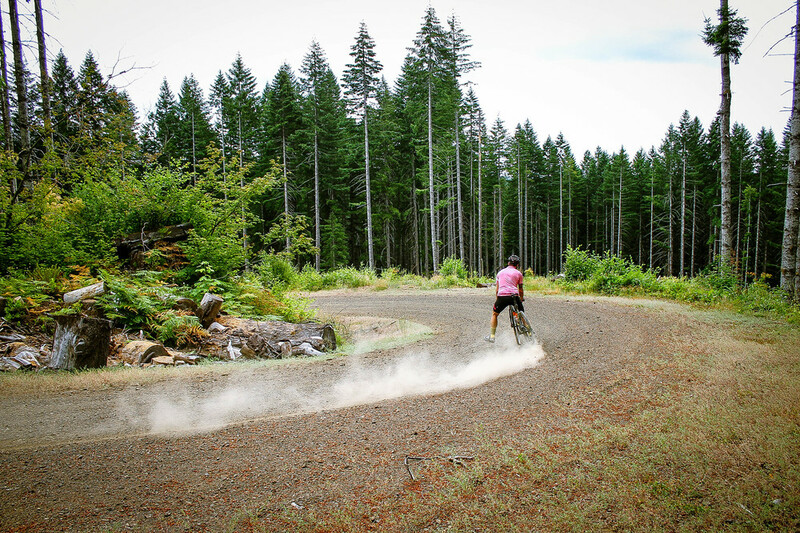 Stay right as the road surface changes abruptly to rocky, rutted dirt for the next 1.5 miles until Standard Grade levels out, crossing the century-old Oregon Railway & Navigation Company tracks, which have been long-since decomissioned and overgrown. Approaching the three-way intersection, bear left, heading northwest onto Wheeler Pond Road. The next 6 miles are fast, flat, smooth-rolling pea-gravel beset by cool white-barked alder glades. The road gently curves to echo the contours of the Salmonberry River. 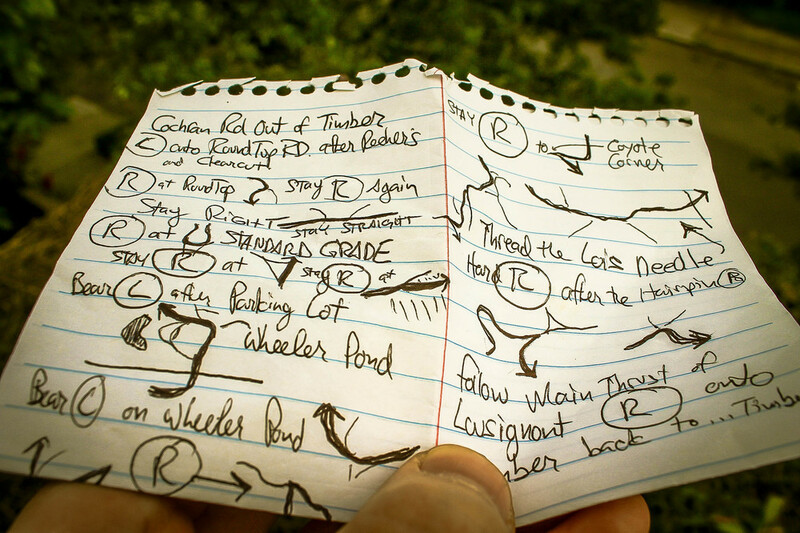 At the next juncture, take a hard right onto Wheeler Cutoff Road, issue of a few curses and start climbing. Wheeler Cutoff immediately pitches up into an imposing 14% average grade for 3/4 of a mile only relenting at the intersection with Shields Road.Take a hard left at Shields onto moderately rocky doubletrack, skirting several clearcut areas and a couple 'gram-worthy vistas before diving into 3 miles of heart-pounding steep-grade hairpin descending, leveling out as it meets Highway 26. Turn left on 26 and follow to the Sunset Rest Area, about 1.5 miles on the right-hand side or the public roadside water spigot. This is a great opportunity to refill water bottles and should be running year-round. From either of those two options, retrace your steps back along 26 by about 1 mile, and pick up gravel again on McGregor Road heading north for roughly 2 miles of moderate climbing. Be mindful of the three 'fakeout' spurs that kick off to the right. At the apex of the climb, just shy of mile 26, you will take the fourth right, which will be Music Road...aka...'Pride of the Coast Range', easily one of the best roads in the area. Music Road is the pure essence of Coast Range riding concentrated into four rapturous miles. Smooth pine needle-softened doubletrack descends and climbs blissfully along sweeping ridges in wide arcs. Majestic stands of Noble fir lend a regal presence with their dome-shaped canopies towering high above precipitous ravines. As all dreams must come to an end, Music Road culminates in a descent back down to Highway 26. Jog west on 26 for a 1/4 mile then pick up Wheeler Road, which heads south and, well...up. Wheeler Road grinds up a three-mile series of medium-grade climbs. Stay right at the four-way intersection and again at the fork. Wheeler banks a hard, hairpin left at 'Coyote Corner' just shy of mile 33 and begins a rough-and-tumble loose, rocky descent for the next six miles. Bear left on Lousignont at mile 34.4 and continue descending. Some may recall this as the site of some rather brutal suffering as Lousignont was run the other direction during the Timber Logjam. At mile 36.3, at the four-way intersection, follow Lousignont around a hard right and continue the doubletrack descent. Again, just about all of these intersections are unmarked and can lead to some tricky second-guessing, so non-cell signal-based GPS is paramount here. Follow Lousignont all the way to Timber Road, take a right and savor the sweet, buttery-smooth tarmac. While the pavement will feel like a dream in contrast to the previous ten miles, Timber Road still has a moderate series of S-curve climbs into the final straightaway back to Cochran Road. You will be glad you topped off those water bottles when you did. After crossing the Nehalem River in Timber, proceed right onto Cochran Road for one last segment of gravel back into Reehers Camp. One thing to be aware of is that most of the gravel, dirt and logging roads in this remote area are unmarked and can have a disorienting array of spurs and dead-end offshoots. It is extremely easy to get lost. A solid Garmin/GPS w/ offline mapping capability (such as RideWithGPS) is highly recommended along w/ a printed map as there is no cell service in this area. Additionally active and frequent logging in this area has a habit of creating new roads and decommissioning others without warning, so don't try this without the route on your GPS.